Original Teen Titans. . Wallpaper and background images in the teen titans club. This teen titans fan art contains anime, komik, manga, and kartun. The Titans came in waves. 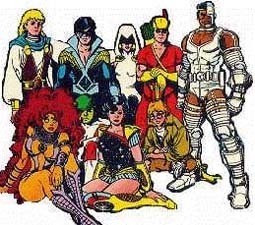 Cyborg, and Raven came in the first wave of new Titans, then Starfire and Beast Boy. This picture contains Nightwing and Speedy(and possibly Donna Troy) who are originals.